The Riverton Cottage Antiques booth at a Crossroads event. You may remember that old ad slogan, “You’ve got to be in it to win it!” It can be applied to many areas in life. If you want to get the most out of any project, occupation, or hobby, you have to get up, get out, and get involved. The more time and interest you expend, the greater the benefits you reap! 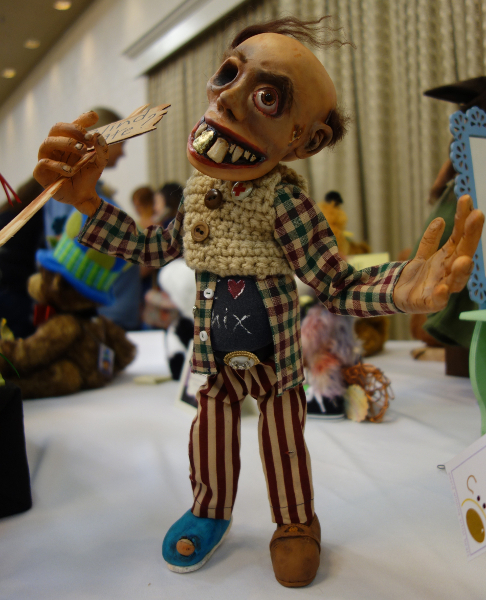 One of the most rewarding pastimes for a doll collector is attending a show. 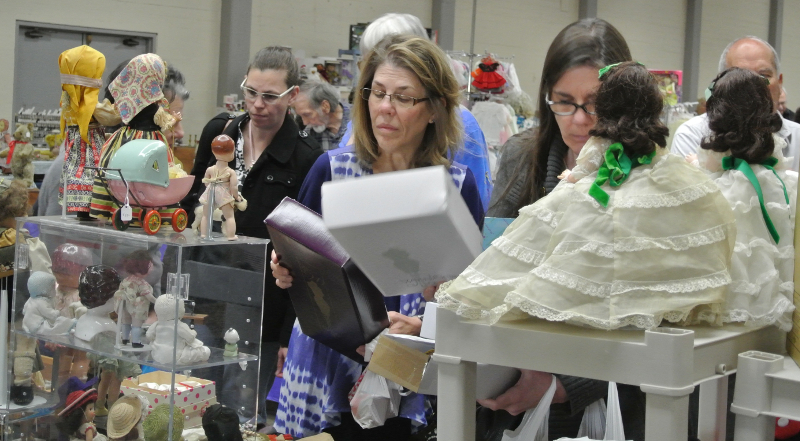 In addition to viewing aisles and booths bursting with dolls, there are chances to chat with artists and appraisers, meet and mingle with like-minded folks, take part in seminars and musical events, even enter raffle drawings to win show specials or other prize packages. DOLLS magazine had the chance to chat with some leading luminaries who know a thing or two about the world of doll shows. Busy promoters Terry Quinlan, Dorothy Drake, Nancy C. Felix-Moore, and Stacey Haskins took time out of their hectic schedules to share an enormous amount of wisdom and insight, while Connie Reynolds, the secretary-treasurer and director of membership for the United Federation of Doll Clubs (UFDC), spoke at length about why doll collectors should walk away from their laptops and take a lap around a convention hall. 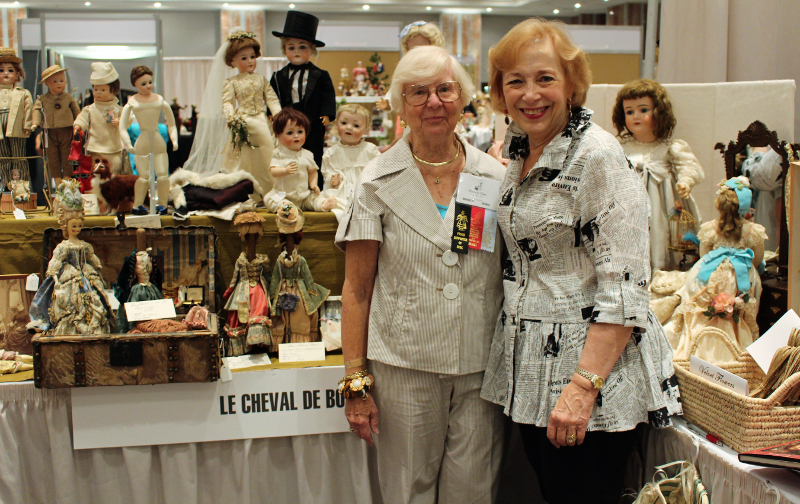 Immersing yourself in a doll show can easily become an annual tradition for collectors! Before the UFDC salesroom opens, many dealers get together to chat and catch up with each other. Lifelong friendships are made at UFDC events. UFDC members can enjoy a week overflowing with seminars, meals, banquets, workshops, and more. 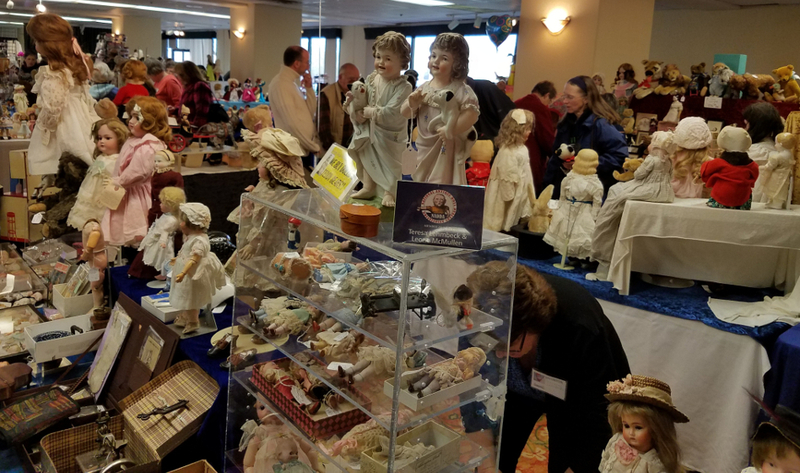 The knowledgeable dealers in the salesroom are passionate about doll collecting and offer dolls of all kinds — antique, vintage, and modern — as well as related merchandise. Pam Farr and Sheryl Williams pose in their booth at the 2017 annual UFDC convention. “If you can’t get away for a whole week of doll fun, then consider attending Public Day, when the salesroom is open to the public for one day only — Saturday, July 27, from 9 a.m. to 3 p.m. You can enjoy the salesroom, as well as the Artist Showcase, and check out Publisher’s Preview, where you’ll meet doll-expert authors with their latest books on sale,” Reynolds said. UFDC president Loretta Nardone with Kim McIntyre at the 2017 annual convention in Orlando, Fla. Artist Maggie Iacono meets and greets collectors at the UFDC 2017 convention. 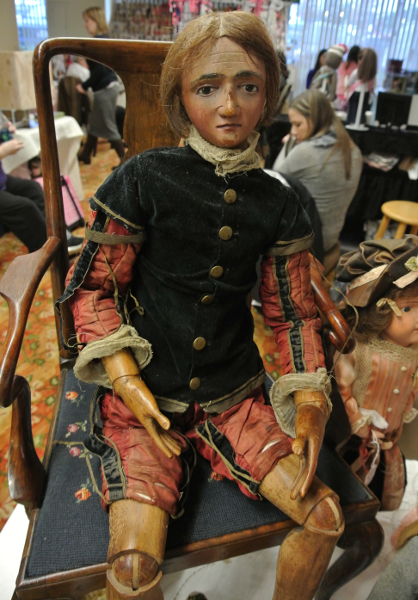 The Wichita Antique Doll Study Club held the first Wichita Doll Show last September. 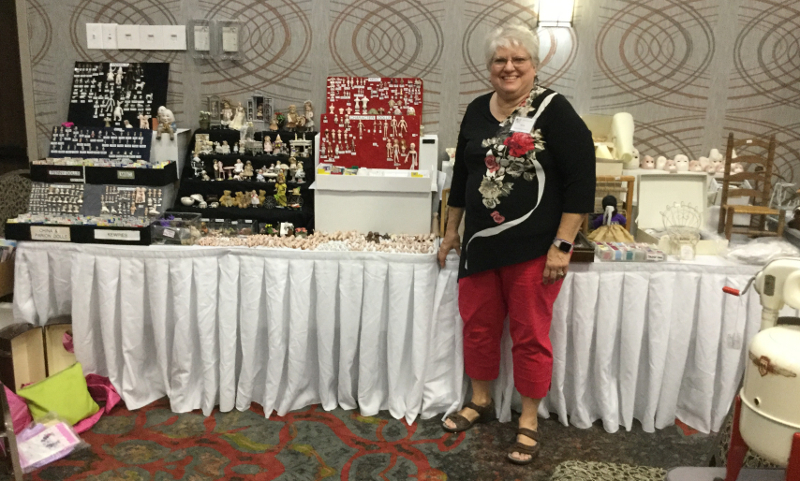 Wichita show promoter, author, and doll expert Nancy C. Felix-Moore has high hopes for the 2018 show, which will be held Saturday, Sept. 29, from 10 a.m. to 4 p.m. at the Holiday Inn on Rock Road in Wichita, Kan.
Pat Boldt, recognized for her work in miniatures, was among the artists at the first annual Wichita Doll Show. “We expect to have dealers with dolls from large to miniature, antique to modern, vintage to BJD and paper dolls, with other doll-related items. 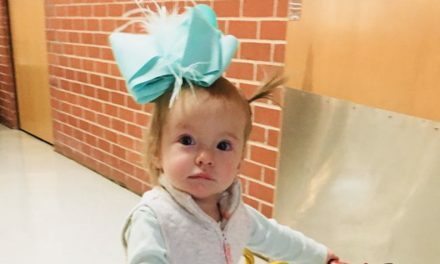 Our first show was so successful that we have doubled the floor space for the second annual Wichita Doll Show,” Moore said. 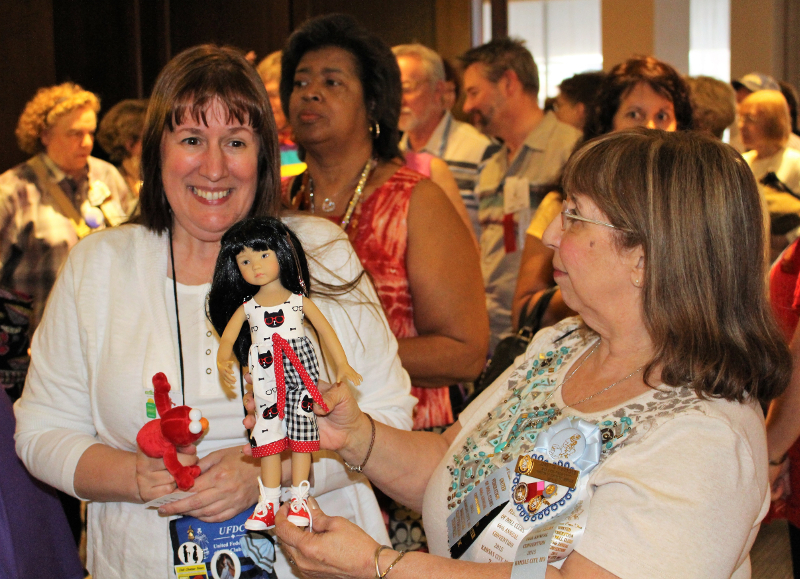 The get-together is the only doll show within a 200-mile radius of Wichita. Centrally located near the interstate, the site is also near restaurants and malls, ideal for venturing out alone or with friends who want to make a day of it. 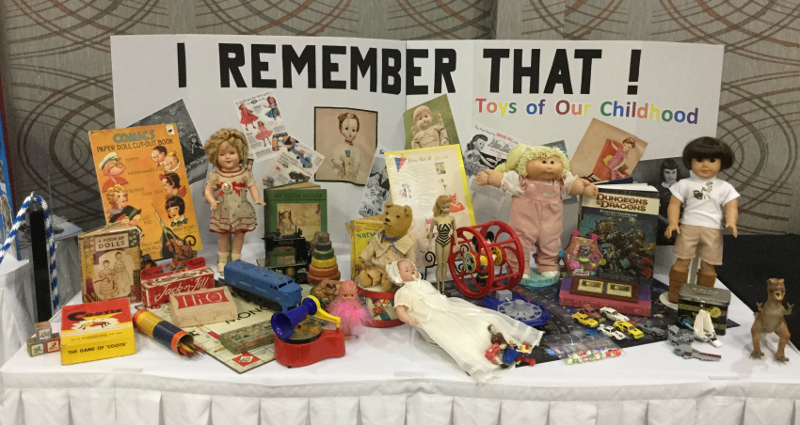 A retrospective of beloved toys from the past was unveiled at the Wichita Doll Show’s first outing. 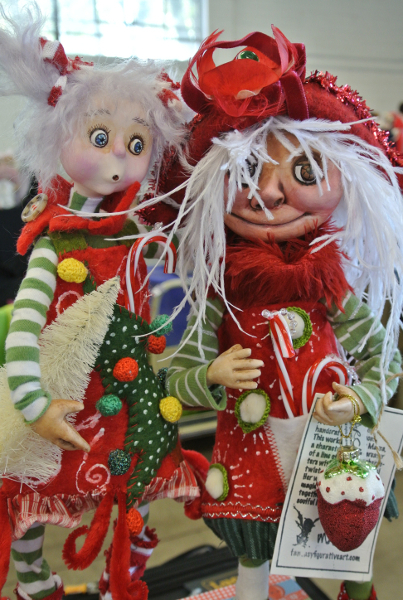 Since the mid-1990s, Dorothy Drake has been producing and promoting doll shows. For 2018, she’s hosting 11 shows on the West Coast. Humorously wondering “if this longevity makes me a dinosaur,” Drake knows a great deal about the doll world. 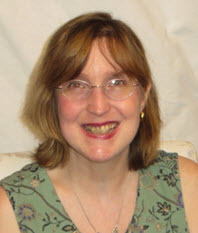 Thanks to her decades-long involvement in putting together the Crossroads Doll & Teddy Bear Shows, charitable events, awards ceremonies, and seminars, she has had a bird’s-eye view of how the collectibles world has evolved over the past 20+ years. A fun seasonal display at a Crossroads show. The view from the Kathy Platt booth at the Crossroads show in Roseville, Calif.
Drake is hands-on in making sure her attendees have a memorable and enjoyable time. “Our goal is to have some kind of interesting event at every show, including in-booth demonstrations, free appraisals, and doll stringing. 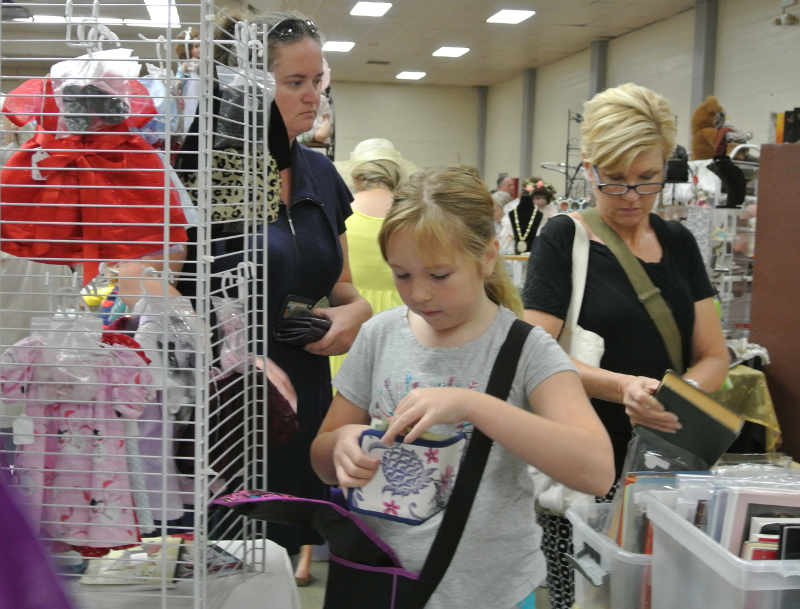 The one thing we don’t want to do is take away from a collector’s shopping time, so we keep most educational activities at vendor booths,” Drake said. This rare example of an antique wooden body was on display at a Crossroads show. Part of Valerie Fogel’s booth at Crossroads. 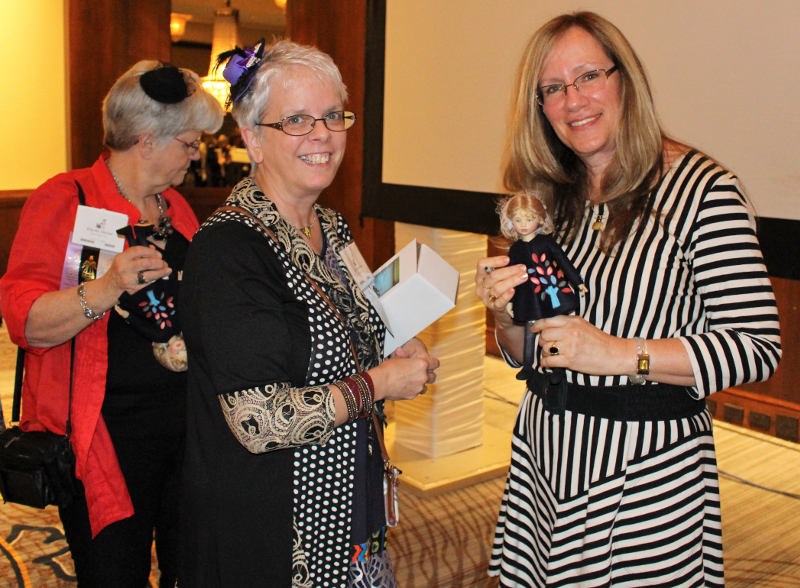 Susan and Terry Quinlan have hosted the Artist Doll & Teddy Bear Convention for seven years. Usually held in early May, the 2018 convention took place April 12 to April 14 at the Clarion Hotel near the Philadelphia Airport. The Saturday portion of the convention — the Artist Doll & Teddy Bear Show & Sale — is open to the public. The Quinlans are proud to introduce collectors to artists and techniques as yet undiscovered by the Internet world. 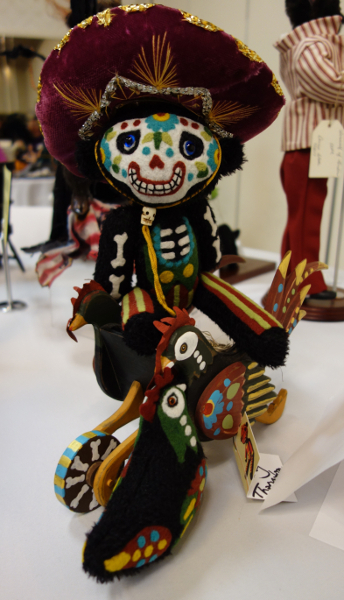 Pictured here is Amy Thornton’s Chick N. Bones doll from the Figures from the Day of the Dead theme table. Artist Tina Parson’s Blind Date? doll from the Bring a Smile to My Face theme table at the Quinlans’ Artist Doll & Teddy Bear event. Quinlan also recommended doll shows as a destination for the budget-minded and for curiosity seekers. “Shows are also a good place for those who like garage sales, as many times there are used items at reduced prices. Shows are great places for finding birthday and Christmas gifts, regardless of when the show is held,” he said. 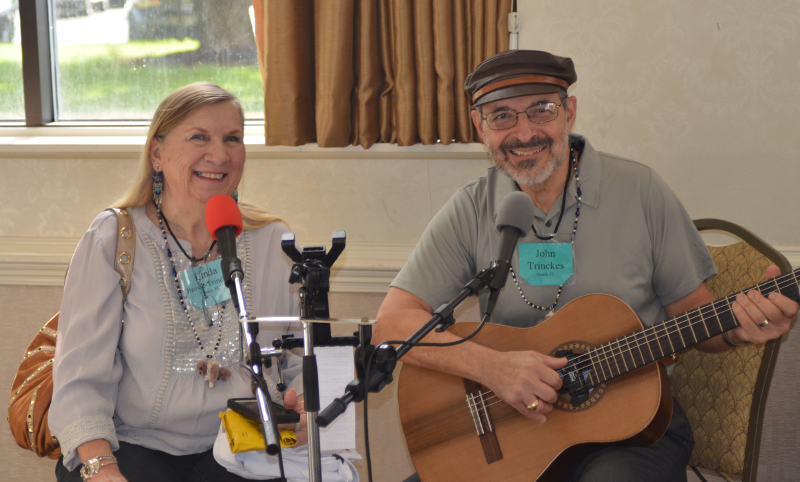 Artist Linda Trinckes and her husband John sing doll and teddy bear songs, which they composed, to entertain those waiting for the doors to open on the Quinlans’ Saturday Show & Sale. Attending the Quinlans’ convention and sale allows collectors to see world-class artistry, such as this Briar Rose doll by artist Rafael Nuri, with a price tag of $50,000, at the Helen Bullard Award for Excellence Judging & Sale. In addition, some artists don’t have an online presence. It’s not that they’re anti-technology, but they have not hopped onto the social-media bandwagon. Attending a live event like the Quinlans’ may be the only opportunity to see a cyber-shy artist’s handiwork. “At a show, you may see new artists you did not know existed. Something you cannot see and appreciate online is how jointing is used to move and rotate parts of the body or how objects are suspended in air, like many dolls by artist Mark Dennis. 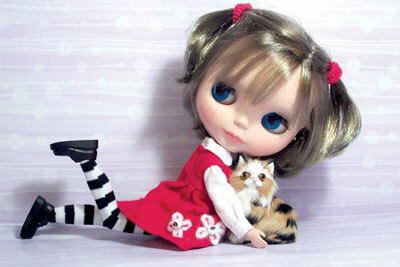 Artists can bring a wide range of dolls, some of which may be very new and not yet available online. When those dolls reflect new materials and techniques, you could be the first to see, at the show, the new style and direction of the artist’s work, which could reflect significant changes,” Terry said. 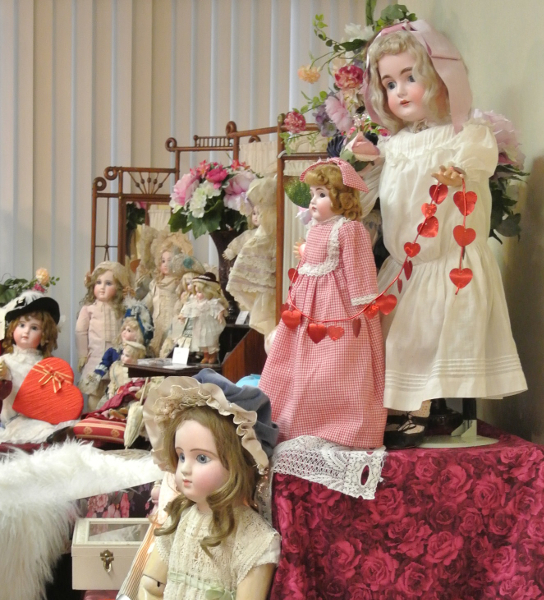 The International Doll & Teddy Show (ID&TS) will hold its fifth annual event in a new venue. The first show, held in Asheville, N.C., in 2014, attracted about 50 vendors and just over 300 collectors. With its move to Orlando, Fla., this year, organizers are expecting more than 100 vendors and up to 1,000 collectors. ID&TS offers workshops June 25-27, followed by the Artist Expo & Sale June 29 and 30. 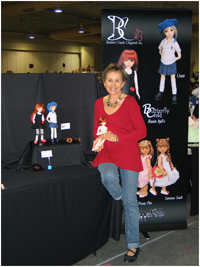 BJD artist Connie Lowe at the Debut of Dolls signing event during the 2017 International Doll & Teddy Show. In addition to classes and the exhibit hall, ID&TS events for 2018 include the annual Awards Banquet Friday, June 29, where DOLLS staff will announce the Industry’s Choice winners in this year’s Dolls Awards of Excellence competition, and the ID&TS Outstanding Artistry awards will be presented. 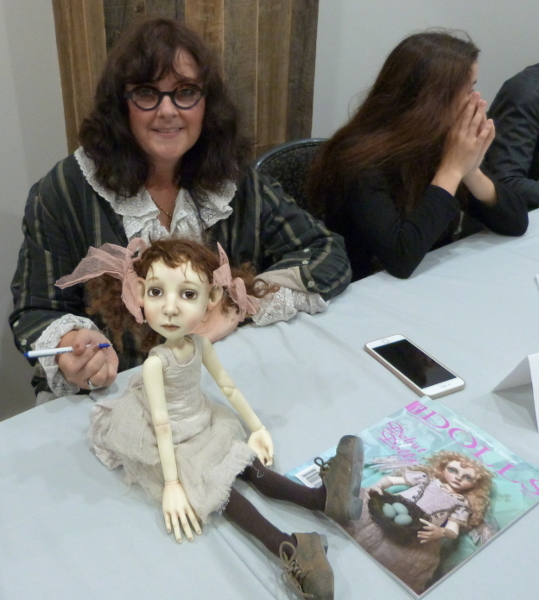 DOLLS magazine also sponsors a special artist signing event before the banquet. A Reborn Baby Shower is scheduled for Saturday evening. 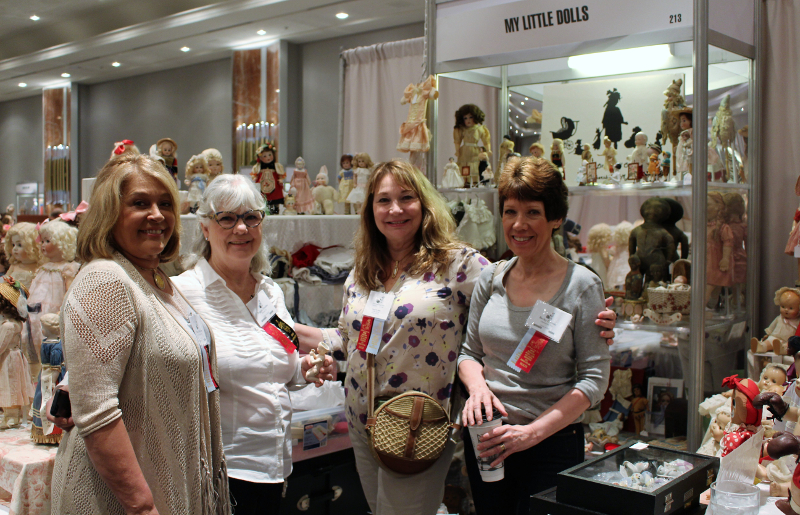 So whether it involves packing a suitcase for a multiday convention or setting aside a weekend morning to stroll through exhibits and sales booths, a doll show is a delightful destination!